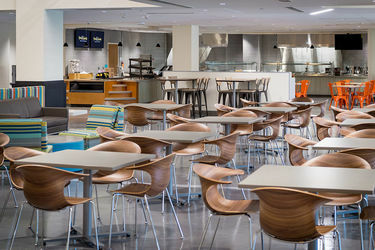 On Monday, January 15, Campus Dining will open three new micro restaurants in the new Duncan Student Center: Hagerty Family Café, Modern Market, and Star Ginger Asian Grill and Noodle Bar. The venues will offer everything from coffee beverages to smoothies to Asian street food and farm fresh whole food options that will appeal to vegans and meat lovers alike. Deciding on the types of fare and the atmosphere was a collaborative, community effort. From very early in the process, representatives from Student Affairs, Facilities Design & Operations, Campus Dining, and Student Government met to to determine what restaurants would be a good fit for the student center. What quickly surfaced was a common desire to bring novel, contemporary venues with healthy snack and meal options to the space. “I am confident that student opinions were not only taken into consideration, but were the driving force behind these venues being chosen. All three will be excellent additions to the new student center,” said Becca Blais, student body president. Mariah Cressy, web manager for Grotto Network (grottonetwork.com), works in Corbett Family Hall on the east side of the stadium. She is not just excited about how close the micro-restaurants are to her work, but as a vegan, she’s looking forward to expanded lunch options. “Before venturing out to campus eateries during my lunch hour, I usually scour the menus online to find out if/how I can modify certain dishes to make them vegan. It’s comforting to know Modern Market is taking that into consideration from the get-go!" Here’s a rundown of what you’ll find there, plus some dish recommendations from Campus Dining staff. Enter Duncan from the north end and walk into the relaxed ambience of Hagerty Family Café. The restaurant will feature Intelligentsia brand coffee, Freshëns® Fresh Food Studio smoothies and crêpes, and a host of delicious pastries and gelato made by Campus Dining’s culinary team. 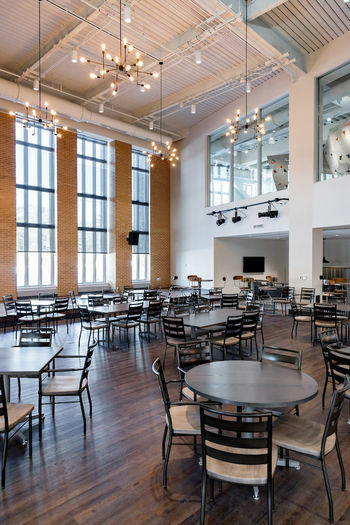 You’ll notice a stage in Hagerty where you can enjoy periodic musical performances, readings and comedy club events. Campus Dining recommends: Nitro Coffee, Nutella Supreme Crêpe and the Vitality Superfood Bowl. 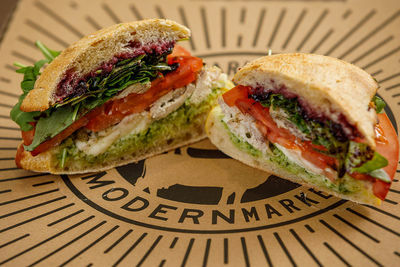 Hours: Monday–Friday, 7:30 a.m.–6:00 p.m. and Saturday–Sunday, 10:00 a.m.–6:00 p.m.
Just inside Door 15 of Duncan is Modern Market, a farm fresh eatery chain created by Notre Dame alumnus Rob McColgan ‘02 and Anthony Pigliacampo, who left their day jobs in 2009 to open their first restaurant. Modern Market’s mission is simply “to serve amazing, healthy food to as many people as possible.” Dishes are made from scratch using whole, simple ingredients and that satisfy any dietary requirement, from gluten-free to vegan. Campus Dining recommends: Peanut Butter Banana Oatmeal, Basil Chicken Sandwich and Steak Caesar Salad. Hours: Sunday–Wednesday, 11:00 a.m.–10:00 p.m. and Thursday–Saturday, 11:00 a.m. –2:00 a.m. This Asian grill and noodle bar is also just inside Door 15. A creation of Chef Mai Pham, who recently visited campus as a guest chef, Star Ginger offers simple dishes inspired by Asian street food and flavors from Thailand, Vietnam, and Singapore. 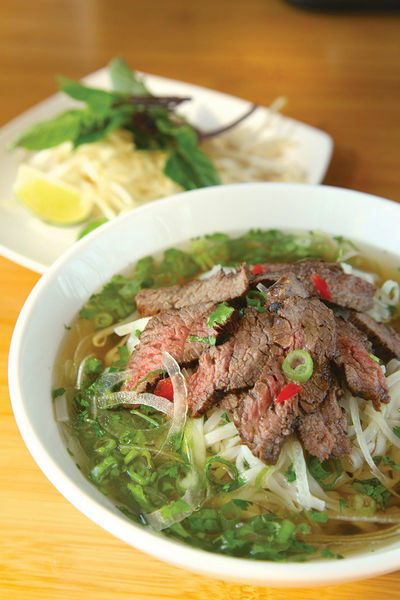 Campus Dining recommends: Vietnamese Phở Bowl, Lemongrass Tofu and Thai Chicken Curry. Originally published by Molly Moran at dining.nd.edu on January 11, 2018.